A well-built roof can tolerate snow, ice, and winter storms – for a few seasons, at least. But there is a right way and a wrong way to deal with winter’s white gifts. When building owners understand the problems that snow causes and the correct way to prepare for it and remove it, they can protect their roof systems through the winter and avoid costly repairs. Think of snow as H2O: Snow comes with all the problems associated with water and moisture. Standing water accumulates under snow as it melts. When the temperature drops, that water becomes ice. If water has migrated into any partially opened seams or defects in the membrane, the expansion and contraction associated with the freeze and thaw cycle can minor roof deficiencies into problem leak areas. Be wary of the weight: Like water, snow is heavy. Enough of it can overwhelm the supporting structure and cause it to collapse. The more likely scenario is that the weight of snow can warp the deck. This can cause long-term structural issues and possible roof leaks. Watch for flooded drains: Snow, especially in the wake of a fast melt, can overwhelm drains. The additional weight of the snow, without proper drainage, can cause structural damage. Don’t scrape as you shovel: Finally, the process of removing snow itself, while necessary to protect the roof, can actually do as much harm as the snow could have done on its own. With workers and equipment on the roof, reduced visibility, and uneven footing, snow removal efforts often lead to tears and punctures – not to mention, pose risks to workers. It’s crucial that building owners think carefully about their snow removal plans. Roof snow removal is an underappreciated skill. There is a common misconception that anyone with a shovel can haul snow over a roof’s edge. Quite the contrary: efficient snow removal requires specific tools. A metal-edged shovel can tear right through a membrane. Even with the right shovel, poor technique can gouge the membrane, causing punctures, tears, and other sources of leaks. Improper removal can also damage flashing and edge metal. The good news is that snow removal presents a golden opportunity to save money and resources. Hire a professional snow removal expert. When a proper snow removal plan is in place and the snow is removed correctly, the cost and effort of snow removal will significantly diminish. 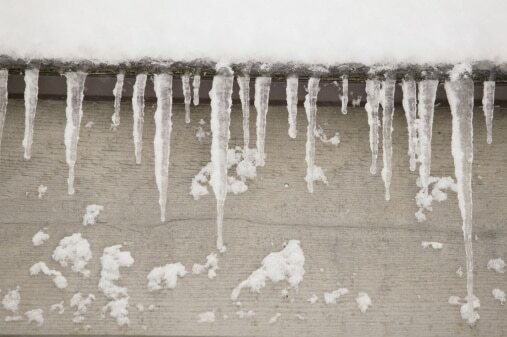 A well-constructed roof might survive one bad winter on its own — maybe even a few. But the accumulation and melt of snow, along with the dangers of the freeze and thaw cycle, will eventually cause degradation that could easily be avoided. A strong winter maintenance schedule executed by experienced professionals, however, will pay for itself in as little as five years by preventing needless repairs and costly damage.